POLISHED CONCRETE BENCHTOP versus GRANITE Benchtop OR MARBLE? Do you prefer "wow" or "nice"? Do you prefer unique or common? Modern or traditional? Our polished concrete is unique, modern and gives you the "wow' factor. When people see concrete benchtops, they are immediately attracted to it and will start touching it and asking questions. I see granite and marble as 70's floral designs - too busy, not soothing to the eye. Even stressful. A granite benchtop. Its quality stone, but it looks like 70's lino. 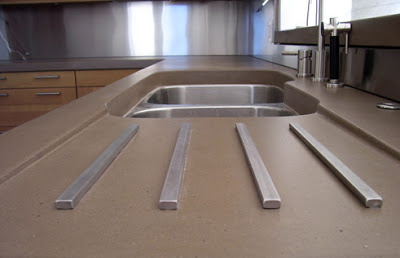 POLISHED CONCRETE BENCHTOP versus corian Benchtop or engineered stone? Do you prefer a blank canvas or a canvas with personality, movement, a story? Concrete has far more character than corian and engineered stone. Concrete feels like quality. Have you ever tapped corian or engineered stone? It gives off a plastic sound. Give it a try. One of these is aesthetically interesting and soothing. It gives the eye a place to rest but has character. What else does concrete have to offer? You can really personalize your benchtop with concrete. Embedding of simple gems is inexpensive and adds a great touch. How about an integrated drainage and trivets. There are unlimited options with concrete. Trust us to keep it simple and stylish. Integrated drainage and trivets. Not our actual work. How does your sealer look and perform? I am a lover of concrete, I prefer not to put a heavy coating of plastic type sealer over our quality material. You will appreciate the feel of the stone, not a heavy coating. The sealer I perfer for concrete kitchen benchtops both penetrates and leaves a micro layer of about 0.2mm. Its called a reactive sealer. I can apply the sealer to a matt, semi gloss and high gloss finish. Under normal circumstances, the sealer will not scratch or stain. It will hold up to your keys, plates and cutlery on a busy daily basis. Like all stones and their sealers, if you leave acidic substance for many hours it will itch the surface. The worst known products are mustard and vinegar, where you have approximately 2 hours before these products will etch the surface. I have searched hard and wide to find the best sealer possible for our benchtops. Check out its application method here and you will start to understand why it works so well. Its not pavement concrete, right? Because I love every benchtop I make like its my child. Well not quite, but my passion to get everything just right may have you thinking so. Digitizedstone is a small company that highly values your satisfaction. Ultra High Performance Concrete = 80mpa. The concrete we use. Our concrete is fully premixed (by men in white coats) in bags to achieve ultra high strengths. Our concrete mix costs around 9 times the price of basic concrete, but the quality, the consistency and the ease of use allow me to focus on making great moulds and finishes. Where do you make it and how long will it take? All our benchtops are fabricated in our workshop and are delivered and installed by us. From the moment I take templates from your cabinets, it will take no longer then 3 weeks before your benches are installed. Can my cabinets support it? Yes, in nearly all cases your cabinets will be able to support our benchtops. We will advise you if adjustments need to be made. Regardless of the edge thickness appearance, your benchtop's actual thickness will be from 20mm to 50mm thick. This will depend on how we reinforce it, either glass fibres or steel. Our standard price is $1050 per square meter, installed. Most kitchens, up to 50mm thickness, are charged at this rate.